← Bees! We got bees! I am sure I’ve mentioned my disdain for slugs. In all my gardens prior to having raised beds, I’ve been plagued by them. They can be so destructive, and no matter how diligently I picked them off young plants (or set up beer traps to drown them, or sprinkle slug pellets, or whatever cure du jour I’d most recently discovered online) they always managed to be one of the peskiest pests. Last year I read about putting up barriers (of varying kinds) to keep them out of my raised beds. The most ingenious one I read about was copper tape. It supposedly works by giving the slugs a mild electrical shock when they touch it, so they won’t cross it. And I must say, it has been very effective as I’ve yet to find one on even the tiniest of my seedlings. My peppers, tomatoes and lettuce seedlings have been growing along untouched by these spineless, shell-less destructors. This is what the copper tape looks like when unrolled. It’s got adhesive on the back so you can just stick it directly onto the wood of your raised bed. Notice that I got smart this year and wore gloves while putting the tape on the beds. Last year I must have been in a hurry (or lazy) and I didn’t wear gloves, and I got some of the most wicked, tiny cuts from it. 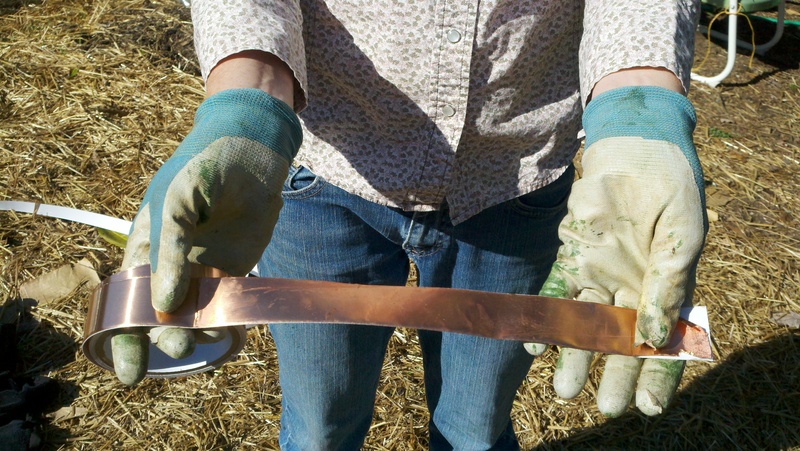 It’s a fairly thin strip of copper so it was kind of like a paper cut, but with thin metal — ow! 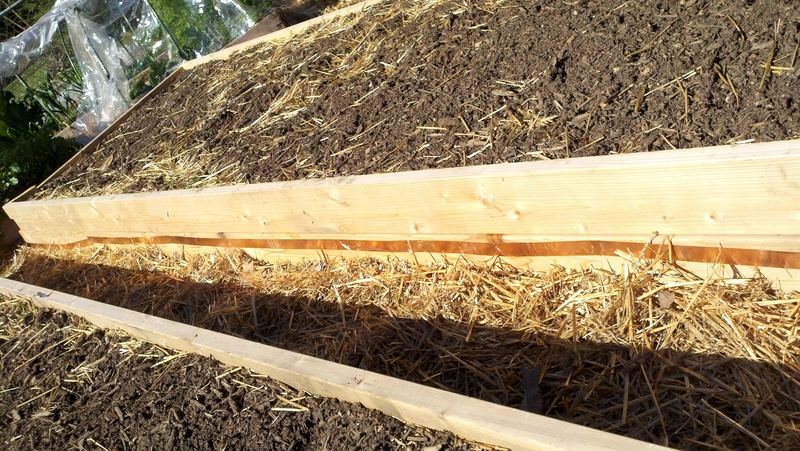 This is what it looked like right after I put the copper strips around my two new raised beds. Those beds are now planted with my tomato and pepper starts, which are safe and sound thanks to the copper. The copper strips I put around the 4 raised beds last spring are still holding on tight. They have a slight green patina to them, but they haven’t peeled off a bit, despite a harsh winter and torrential spring rains. 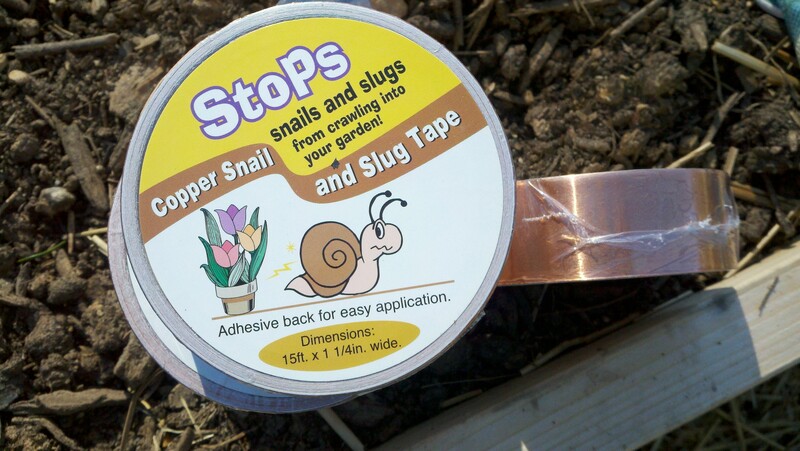 One thing I did read about in a gardening forum is that you must keep weeds and other plants from growing up over the copper strips, because the slugs will use it as a “bridge” to avoid getting shocked and get to your plants. Which reminds me, I need to go out and weed right now…..